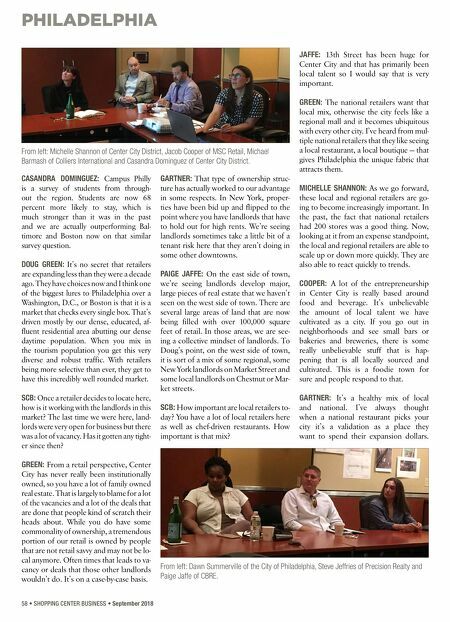 PHILADELPHIA 58 • SHOPPING CENTER BUSINESS • September 2018 CASANDRA DOMINGUEZ: Campus Philly is a survey of students from through- out the region. Students are now 68 percent more likely to stay, which is much stronger than it was in the past and we are actually outperforming Bal- timore and Boston now on that similar survey question. DOUG GREEN: It's no secret that retailers are expanding less than they were a decade ago. They have choices now and I think one of the biggest lures to Philadelphia over a Washington, D.C., or Boston is that it is a market that checks every single box. That's driven mostly by our dense, educated, af- fluent residential area abutting our dense daytime population. When you mix in the tourism population you get this very diverse and robust traffic. With retailers being more selective than ever, they get to have this incredibly well rounded market. SCB: Once a retailer decides to locate here, how is it working with the landlords in this market? The last time we were here, land- lords were very open for business but there was a lot of vacancy. Has it gotten any tight- er since then? GREEN: From a retail perspective, Center City has never really been institutionally owned, so you have a lot of family owned real estate. That is largely to blame for a lot of the vacancies and a lot of the deals that are done that people kind of scratch their heads about. While you do have some commonality of ownership, a tremendous portion of our retail is owned by people that are not retail savvy and may not be lo- cal anymore. Often times that leads to va- cancy or deals that those other landlords wouldn't do. It's on a case-by-case basis. GARTNER: That type of ownership struc- ture has actually worked to our advantage in some respects. In New York, proper- ties have been bid up and flipped to the point where you have landlords that have to hold out for high rents. We're seeing landlords sometimes take a little bit of a tenant risk here that they aren't doing in some other downtowns. PAIGE JAFFE: On the east side of town, we're seeing landlords develop major, large pieces of real estate that we haven't seen on the west side of town. 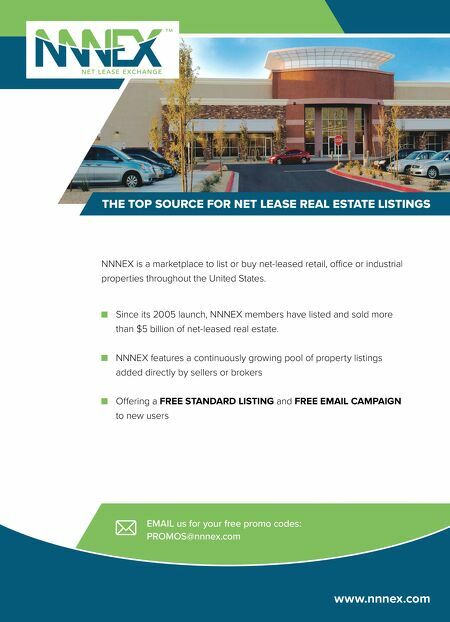 There are several large areas of land that are now being filled with over 100,000 square feet of retail. In those areas, we are see- ing a collective mindset of landlords. To Doug's point, on the west side of town, it is sort of a mix of some regional, some New York landlords on Market Street and some local landlords on Chestnut or Mar- ket streets. SCB: How important are local retailers to- day? You have a lot of local retailers here as well as chef-driven restaurants. How important is that mix? JAFFE: 13th Street has been huge for Center City and that has primarily been local talent so I would say that is very important. GREEN: The national retailers want that local mix, otherwise the city feels like a regional mall and it becomes ubiquitous with every other city. I've heard from mul- tiple national retailers that they like seeing a local restaurant, a local boutique — that gives Philadelphia the unique fabric that attracts them. MICHELLE SHANNON: As we go forward, these local and regional retailers are go- ing to become increasingly important. In the past, the fact that national retailers had 200 stores was a good thing. Now, looking at it from an expense standpoint, the local and regional retailers are able to scale up or down more quickly. They are also able to react quickly to trends. COOPER: A lot of the entrepreneurship in Center City is really based around food and beverage. It's unbelievable the amount of local talent we have cultivated as a city. If you go out in neighborhoods and see small bars or bakeries and breweries, there is some really unbelievable stuff that is hap- pening that is all locally sourced and cultivated. This is a foodie town for sure and people respond to that. GARTNER: It's a healthy mix of local and national. I've always thought when a national restaurant picks your city it's a validation as a place they want to spend their expansion dollars. From left: Michelle Shannon of Center City District, Jacob Cooper of MSC Retail, Michael Barmash of Colliers International and Casandra Dominguez of Center City District. From left: Dawn Summerville of the City of Philadelphia, Steve Jeffries of Precision Realty and Paige Jaffe of CBRE.